Change Isn’t Easy. But That’s No Excuse. My routine this morning was probably a lot like yours. I rolled out of bed, sucked down the coffee, and went to work. Problem was, I couldn’t work. First came the Facebook notification (so timely too!) 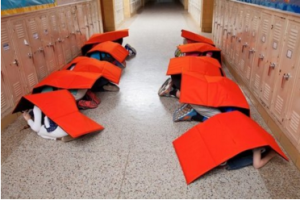 about bullet-proof blankets for elementary children. They’re so simple. Just put your little arms through these handy straps and assume the fetal position i n the hallway. I wonder if the manufacturer contemplated their color choice: red, as in the bullseye. Savvy marketers that they are, they did remember to offer different sizes. The morning headlines informed me that one of the most prestigious schools in my community canceled their orchestra and hula groups’ much-anticipated Christmas tour to New York City and Rome. They’d been scheduled to perform near the Vatican on Christmas Day. Now they have cancelled tickets and a wariness of the world. “It’s just a real shame the world is in the shape it’s in,” explained the Head of School when making the announcement. I thought back to a conversation yesterday with a gifted educator telling me about preschools now performing active shooter drills, where the “pretend” maniac uses a toy gun to hunt through the hallways while teachers and children practice hiding and remaining quiet in the face of fear. Maybe someone thought that was a good idea. To me, these drills sound like a prescription for PTSD and paranoia before the kids’ first roller-coaster ride. Then came the story from a friend about her 95-year old mother, who loves the warm, inviting assisted living facility where she now lives. “The topic of conversation at the dinner table last night,” my friend said, “was how vulnerable they all feel and how afraid they are. The building is without security and is welcoming and loving to all who enter.” Old people, jello salad, roast chicken, and a wary eye for the gunman in the shadows. Do they wonder how they’ll escape, duck under the table, or make a run for the door? Do they look at their feeble limbs and walkers and canes and feel scared, helpless? Once again, our most precious and vulnerable – our children and our elders – are most afraid, feeling most at risk. I’m all for the “thoughts and prayers.” In my day-to-day life, I figure I need as many of those as I can get. But seriously, when have they ever solved anything? In my everyday normal life, “thoughts and prayers” have never helped me shed a pound, land a client, overcome PTSD, recover from a broken heart, or get out of bed when what I want most is to pull the covers over my head. Anybody who’s ever faced a challenge knows this. Sometimes, we let our challenges become our new normal, devoid of the conviction or courage or dedication to force the change we want. We get tired. We give up. I have come to terms with these extra pounds I drag around, accepting that they may be with me for a while. When it takes 30 minutes to go three miles because of insufferable gridlock, I choose to turn up the tunes and accept it. When fuel prices plummet and airfares soar, I still buy the ticket to bring my son home for Christmas. I could make other choices – lose the weight, walk, bring him home for Valentines Day instead, when prices drop. I make the choice to accept these things as my normal, my life, my world. I do not, however, choose to accept active shooter drills and the gunning down of innocents as our new normal, our way of life. I do not choose to accept the notion that the world is a sad and scary place. And I do not choose to accept the notion that this is a “political” problem, one that can only be solved in Washington, or by others. I do not believe that the rest of us are bystanders while “they” choose whether to address the problem or not. Change isn’t easy. It never is. There are conflicting views, long-held beliefs, complications and contingencies deep enough to drown in. But I believe that solutions come with discussion, understanding, compromise, hard work. They don’t come in some big sweeping wave, but rather drop by drop, until collectively, a reservoir of hope springs up. This is our world and our problem and our “thoughts and prayers” are a given. But we can’t stop there. We can’t accept these atrocities as our new normal. We can’t just wring our hands and whine about it. We can do something. Pick up the phone. Send an email. Start a discussion. Donate money to the organizations trying to effect changes in our laws. Support candidates who share your views; oppose those who don’t. Volunteer in mental health facilities and advocate for better mental health care. Get involved. Stuff envelopes. Show up at rallies. Write letters to your newspaper. Talk to your children and your neighbors and even those family members who don’t share your point of view. Don’t scream at each other. Listen, and try to understand. Make it a priority. Make it important. This isn’t a problem for the politicians and the leaders and the religious zealots. We can’t point to them and say “fix this.” That’s our job. Get the parade for change going, and they’ll fall right in. Because there’s one thing we all know to be true: every politician, leader, and religious zealot loves a good parade. It’s our job to give them one. ← Is This Who We Are Now?